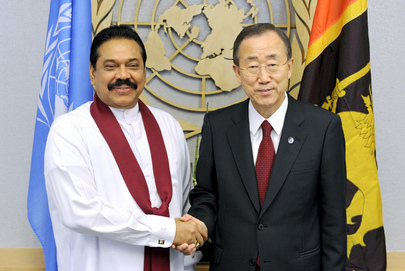 UNITED NATIONS, December 17 -- Less than a month before its report of war crimes in Sri Lanka is due, UN Secretary General Ban Ki-moon's Panel of Experts “is now able to visit Sri Lanka and meet with the Commission on Lessons Learnt and Reconciliation,” Ban told the Press on Friday. In fact, Rajapaksa and his ministers have opposed Ban's panel at every turn, getting Ban to expressly limit it advising him on models of accountability. The Panel said it would accept evidence until December 15, but neglected to empty its e-mail in-box, resulting in submissions being refused. Similarly, evidence submitted by the Federal Express overnight mail service was rejected, with no one present to accept packages, even on the deadline. Inner City Press was told, after it asked and wrote about these rejections of evidence, that there would be an extension. This was said publicly by UN acting Deputy Spokesman Farhan Haq on December 16 -- but 24 hours later, no extension has confirmed, despite the report being due in less than a month. But the Panel, Ban says, will travel to Sri Lanka, if only to speak with the government's own LLRC. We'll see. Earlier on December 17, Inner City Press posed questions about Sri Lanka to Austrian Ambassador to the UN Thomas Mayr-Harting, who leaves the UN Security Council in two weeks. On the topic of accountability for war crimes in Sri Lanka, Mayr-Harting said things “have not moved where it should have moved,” while saying that the Security Council's “informal interactive dialogues” with Sri Lanka were helpful, and led to the same format for Chad and the Cheonan sinking incident between the Koreas. On December 16, Inner City Press asked the UN's expert on Sexual Violence and Conflict Margot Wallstrom about the new video evidence of women killed by soldiers in the final stages of the conflict. Wallstrom said such evidence is important and that her office is still deciding on which countries to focus on. She is asking the UN General Assembly for nine posts, but they only want to give seven. Watch this site. On December 15 at noon, Inner City Press asked and wrote about the e-mail bounce backs. That evening, Inner City Press heard that based on the mounting questions, it was acknowledged that some extension might be required, though perhaps limited to those who could prove their submission was bounced back. Inner City Press asked, does this reflect the Panel's lack of seriousness? Haq said that while the Panel's three members “travel” -- though not to Sri Lanka, which they have not even asked to visit -- there is a Secretariat. But why then were e-mails bounced due to a full mail box? Why could Fed Ex packages not be delivered to the Panel? It is estimated, to Inner City Press, that some 1100 submissions had been received as of the end of November. How many more were rejected or bounced back? Watch this site.